ACCELERATE Special Gasoline brand ambassador Giordano Lupini has had quite a racing season so far. 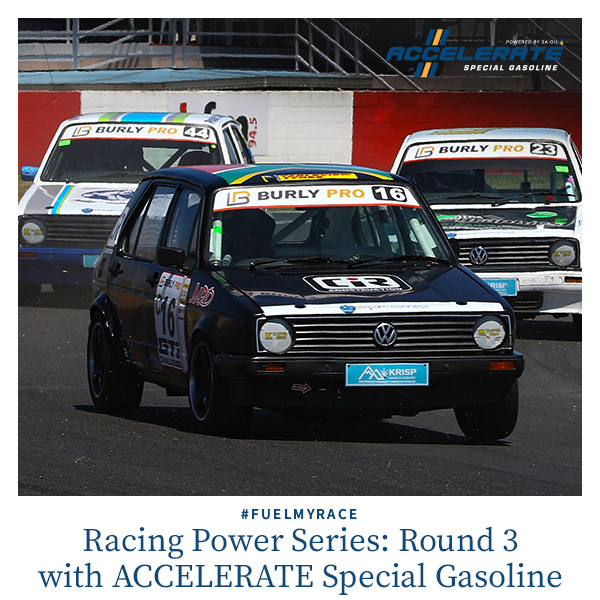 The young racer snagged two wins in Round 1 and Round 2 of the Power Series earlier this year, as well as best lap time in both sets, despite a tremendous car crash that totalled his Maserati-yellow Golf just a day before Round 2 commenced. As a result, Giordano’s back in his old back Golf for the time being…but with a two-month break coming up after the 13th April race meeting, there will be plenty of time to try out a new look for the Go-Go Golf – watch this space! Currently sitting top of the log with 37 points, we eagerly await to see if his winning streak will continue! But Giordano definitely has his work cut out for him – as the frontrunner of the Class C Burly Pro WP Challenge races, he’s got a target on his back, and his rivals will be sure to make this a race Giordano won’t soon forget. We’ll be cheering for #TeamGiordano on the day… Follow our Facebook or Twitter pages to do the same…! Motorsport fans can expect yet another day of epic racing, with a variety of races and attractions in addition to the next set of the much-anticipated Class C Burly Pro WP Challenge races – Killarney International Raceway will be stock-full of spectacular supercars, bikes that braaaap, big V8s and more. Gates open at 08:00a.m. Tickets are R80 for adults, and R20 for children between 12-16. Don’t miss this awesome automotive experience – book your tickets now! ACCELERATE Special Gasoline is a high-octane, unleaded, specially formulated fuel for high performance vehicles. Don’t miss your chance to kick asphalt out on the track – fuel your race with the fuel of champions, as used by Giordano Lupini!